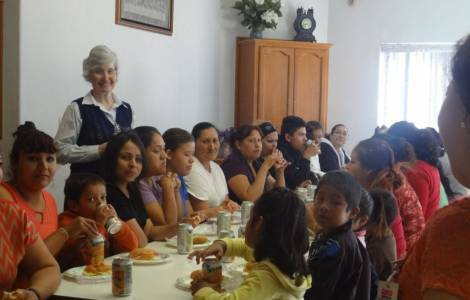 Boa Vista (Agenzia Fides) - The project launched in Brazil by the Scalabrinian Missionary Sisters is called "Venezuelan Migration, appeal to solidarity", who since their foundation have been dealing with assistance to migrants, to try to help the many Venezuelans who are fleeing from their Country. In Boa Vista, in the north of Brazil, the nuns are welcoming them as they did before for Haitian migrants. According to information sent to Agenzia Fides, they are offered not only a roof, but also legal advice, teaching of the local language and, above all, a service of orientation to the world of work and spiritual assistance. From the city, capital of the State of Roraima, some Venezuelan families are transferred, on scheduled flights organized by the Brazilian government, to the "Casa Madre Assunta" of Vila Prudente, in Sao Paulo, Brazil. This structure was an orphanage for the children of Italian emigrants, and now houses a group of 6 Venezuelan families while another 30 people will arrive by the end of February. "Thanks also to the collaboration with the sisters present in Brazil - explains Sister Neusa de Fatima Mariano, superior general - we have started to look for temporary shelters, from 3 to 6 months. Through our sisters we want to involve other religious Congregations, institutions, parishes and families. We want to create a very open project, aware that the space that we will make available will not be sufficient and will not be able to meet the needs of many people looking for temporary shelter. We therefore ask for the involvement of all to offer refuge to migrants for a certain period, between 3 and 6 months. The Venezuelan situation is very critical and the path of solidarity that involves Brazil is a challenge for us to follow".